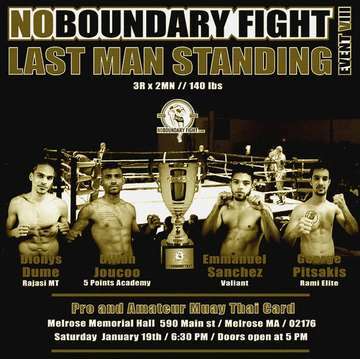 > Events in Massachusetts > Noboundaryfight VIII "Last Man Standing"
Noboundaryfight VIII "Last Man Standing"
Noboundaryfight will be back at his Signature Place the Melrose Memorial Hall, for his first Show of the Year on January 19th, 2019. The highlights of the night will be a 4 Men tournament, "The Last Man Standing" at the 140LBs weight class. 15 Bouts of Muay Thai fights, including 2 great title fights. Great entertainment, food, and drinks. Don’t miss out, get your tickets from the participant gyms, fighters and online.